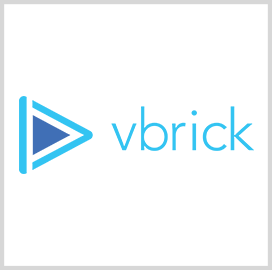 Vbrick Systems has received approval under the Federal Risk and Authorization Management Program to offer a technology platform designed to help agencies capture, process and distribute live and on-demand videos to multiple devices. The company said Monday its Rev flagship product completed FedRAMP's risk management and security assessment process the Office of Management and Budget requires for cloud services providers to pass before doing business with the government. Rev works to process video content intended for training, policy compliance, outreach and marketing applications. "This is a major step and the first of many announcements we anticipate as we pursue other certifications and higher levels of authorization," Vbrick CEO Shelly Heiden said. Terry Medhurst, chief information officer of Vbrick, said the customer agencies can adopt the company's technology via FedRAMP in efforts to engage people with live video.